Simply gorgeous to look at and read, Counting On You is another stunning publication by the Melbourne-based dynamic duo, Corinne Fenton and Robin Cowcher,released just in time for Father’s Day. The perfect partner to You Have My Heart, Counting On You is also based on Parrot’s classification of the six emotions; joy, sadness, fear, anger, surprise and love. This small simple book with its padded cover is padded with delight. While the previous publication is centred on ayoung girl and her bright red balloon, Counting On You delivers the same engagement with a young boy and his blue kite floating through each page just like the ever-changing tide of human emotion. The perfect gift for someone you love, this book also enables children to identify with their different emotions. Reassuring children that while some days will be “reach for the sky days” and other days may be “days when I cry”, love will always remain constant. The simplicity of the text and the stunning sketch-like illustrations prove that sometimes less is more. Robin Cowcher’s signature style of limited colour and simple lines are, once again, an ideal complement to Corinne Fenton’s beautifully strung together words. 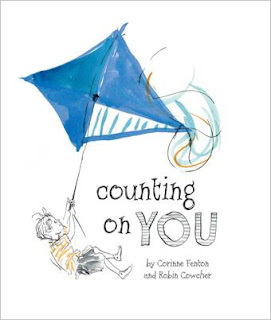 Uplifting and encouraging, Counting On You is perfectly designed to be read aloud, over and over again.